Hiring managers see hundreds of resumes pass over their desks, yet they’re expected to pick out a few key applicants worthy of getting an interview. If you want to get yourself chosen for this honor, you need to craft a resume that stands out from the rest. Employers want to see your professional worth in a stylish, easy-to-read document. This means you need to know how to design a layout and what content to include in each section. Thankfully, you don’t have to take on this difficult task on your own. We offer tons of contemporary and standard resume templates you can use for your own file. Not only do we give you a great design base, we even help you figure out what career-related phrases to use through our writing tips. 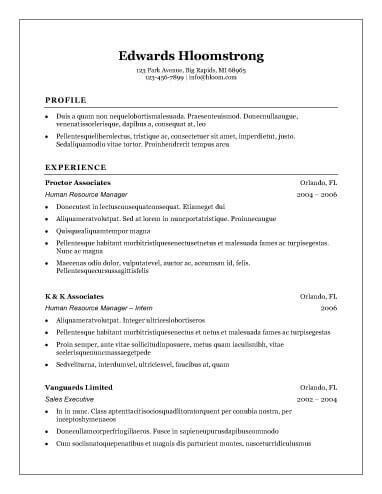 Why Use Standard Resume Templates? You need to create a document that stands out from the rest, so why should you use standard resume templates? The answer is simple, flash does not always translate to success. Basic design elements, such as a black and white color scheme, bulleted lists, headers, simple fonts, and short paragraphs, can help make your resume more appealing through simplicity. Standard layouts also focus more on content than style, which many employers appreciate. If you use one of our tried and true layouts, you may notice a variety of other benefits. Find guides on how to write a resume. See tips to help you pick a style that fits your experience. Even standard resume templates have to take modern worries into consideration. For example, many companies today use applicant tracking systems to help them sort through the initial group of candidates by searching for keywords. Many modern documents use an ATS-friendly layout to ensure candidates make it past the computerized screening process. Candidates applying to extremely traditionally conservative positions, like lawyer, accountant, realtor, or nurse, may need to use one of our basic standard resume templates. These traditional layouts focus on the simple design elements to make sure your document is universally appealing. Even though the formats are basic, you can find exciting designs that show off a bit of personality. Entry-level applicants face unique challenges. For example, many recruiters say they want candidates who have at least three years of experience, but a recent graduate might not have the required professional history. Instead, they must show hiring managers they have the potential to succeed. Our entry-level samples show how you can use standard resume templates to showcase your potential. Most of our standard resume templates have stamps of approval from other users. You can even choose to look at layouts based on how popular they are. Check out some of our best layouts to get an idea of the design elements known for their success. This look at the tried and true formats may help you better understand what you should look for in your own files. Many jobseekers have strong skills and significant work experience. For this reason, combination layouts have become more popular throughout the standard resume templates. A combination format mashes together two traditional layouts, chronological and functional, to simultaneously focus on experience and skills rather than one or the other. Applicants whose work experience takes place at a single company often find this format useful. Because hiring managers only spend six seconds looking at a typical resume before deciding to throw it aside or learn more, you need to do everything you can to make yourself come across as a competitive applicant. This means including pertinent information that can help you land the job. Our standard resume templates give you a great starting point. These layouts include the top sections hiring managers want to see. You can even get industry-specific tips on what type of content to fill the page with by looking over some of the resume samples available here. Employers want to know who you are and how they can reach you. Make sure to include your full name, professional email address, best phone number, and city and state of residence. You can also include a link to a professional website or social media contacts in this section. Most modern employers want you to create a summary statement as the opening paragraph or bulleted list for your document. This statement goes over your most impressive skills, accomplishments, and experiences to make your professional worth clear. Objective statements introduce what you want to get out of a job and are not as popular with employers. Use this section to make your fit for the job clear by incorporating skills and qualifications needed to do the job well. You can find out what hiring managers are looking for in an employee by reading through the job description. Try to include at least five and no more than eight short phrases that describe applicable skills. You can go over your past employment, impressive professional accomplishments, and typical responsibilities throughout this part of the resume. Typically, you should include the name of the position and the employer, employment dates, and three to five things you did for each past job. Try to incorporate active verbs and metrics to make this section more engaging. Show recruiters you have the technical skills needed to do your job by listing out any college degrees or professional certifications you have. While it may be tempting, avoid discussing your high school education unless you have to university-level experience. Recent grads may include their graduation date and GPA if desired. If your experience deviates from the standard, you may want to include atypical sections, such as achievements and awards, interests and activities, or professional memberships and affiliations. * You get help with other aspects of the job search, such as writing a cover letter and preparing for an interview. * There’s no limit to the number of resumes you can create. * It helps check documents over for grammar, formatting, and spelling errors. * Using the tool once gives you access to a variety of file types and even a downloadable version. * You don’t need to know anything about document design. Whether you like the convenience or inspiration provided by a resume builder, this tool can make your job search end faster.